£8,000 Bingo Linx Jackpots – Everyday! * New customers only. Register with promo code BINGO90. Min deposit & stake £10 on Bingo Tickets to qualify. £30 Bingo Bonus must be wagered 2x prior to withdrawal. £10 Rainbow Riches Slot Bonus must be wagered 15x prior to withdrawal. Bonus expires after 14 days. Bonus Balance is used prior to Cash Balance. 50 Free Spins on Rainbow Ryan credited within 24 hours of qualification. Free Spins expiry after 7 days. T&Cs apply. Betfred Bingo is part of the Virtue Fusion network and has lots of bingo rooms and slots to keep you all entertained. Dive in to bingo! Betfred Bingo have a great welcome offer plus players can also enjoy frequent promotions such as Value Night and Rush Hours. 02/02/17 You could win a share of £1 million What's worse than the January Blues? February Blues. Yes, we are truly in the depths of Winter and we're all just looking forward to Spring but here's something to brighten your days a little. Some of the biggest... read more..
15/09/16 Lots of chances to win This September there are lots of chances to win in a huge prize draw across lots of the best bingo sites. Sites in the Virtue Fusion Network are taking part and there are 60,000 cash prizes to be won! How do I get Tickets? Simply spend money... read more.. 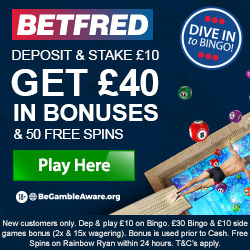 There is a huge £400,000 at Betfred this weekend! Friday 26th August to Sunday 28th August Betfred are running a huge £400k giveaway. The prizes are spread across 4 great rooms and the game type varies too so there is something for everyone. Play Now Have a look... read more.. The Big Love2Shop Voucher Giveaway Check out Betfred Bingo for this amazing Christmas Cracker! For the next 14 days you can take part in the Love2shop voucher giveaway - from Monday 3rd – Sunday 16th December, you could win one of 4 x £200 vouchers, or 10 x £25... read more.. Play the Betfred Bingo "Wimbledon Legs 11" teaser and you could win some FREE bingo bonuses!! The Wimbledon Tennis touranment comes to end this weekend, so how about one last Tennis themed promotion... which you'll find this one very easy if like me you only watch the Tennis... read more.. The Queen’s Diamond Jubilee celebrations are under way and despite the poor weather I'm sure you will find plenty to keep you occupied! How about Betfred Bingo's huge £300,000 bingo giveaway? Starting at the 1st of June and running through to the 5th June,... read more.. Prepare yourself for one of the biggest promotions in the history of Betfred Bingo! From March 30th until April 9th Betfred Bingo are boosting prizes in lunchtime games, weekend afternoon games and evening games to guarantee prize money of more than £1 million over the 11-day... read more.. This weekend Betfred players can enjoy £1,000 of Free Bingo plus new and existing Betfred Bingo players can also look forward to a great weekend of offers and Bingo promotions: The Bonus King Room The Bonus king opens its doors this weekend for a mouth watering £1000 worth... read more..
Don't miss your Free Bingo at Betfred Gain access to Super Free Bingo also known as Superbooks in The Premiership Goals Galore Room by entering the Bonus code: Goals Galore in the Bingo Lobby. Keep your eyes and ears peeled and don't miss out on our weekly Super Free Bingo.... read more.. Displaying 1 - 9 of 9 posts.